In 2010, in his first year as the starting quarterback, Seurer led Olathe South to 7-4 record which resulted in a berth in the Sectional Round of the playoffs. Seurer has football genes--his father, Frank Sr., starred at Kansas and later spent time in the NFL including two starts with the Chiefs in 1987. With bloodlines like those it's only natural that the younger Seurer has become such a gamer in the Sunflower League. As a sophomore nothing Seurer did really jumped off the stat sheet. He passed for 424 yards and four touchdowns, which were modest totals in Olathe South's run-heavy offense, but certainly nothing that would signify an upcoming gunslinger. Perhaps it was Seurer's game managing ability that was most impressive. For a sophomore to come in and execute the Falcon's triple option based offense the way he did, in year one, was quite impressive. Often times it takes a big-time quarterback a year of being a game manager before they break out of their shell and begin showcasing their talents. 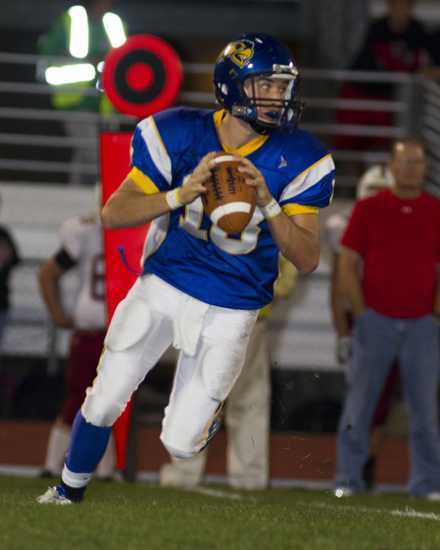 Derek Miller spent a year in that role for Olathe East in 2003, and he turned out to be one of the winningest quarterbacks in league history with 31 career wins as a starter. Seurer has a chance to leave a sizeable mark in Olathe quarterback history if he is able to progress and build off his successes from 2010. Spot Light on this guy??? ?They will put a spot light on anyone. How about the OS mascot next week. 400 yds passing??? There are guys who rush for more yards in single games. I have to agree with the previous comment. But I still love this blog. I look at it almost daily. Keep it up Underwood. forget daily, I check this blog almost every hour! Frankie is a good player to spotlight as an up and comer with potential. It Will be interesting to see what he can really do after getting beat up so much last year. And will they really throw the ball. If not then it will be a similar year for him and OS. And I am not a OS fan. Triple Option attack? Did you even watch OS last year? Hey smart guy...do you have any idea what offense south runs? Your comment is ignorant. How do you spell ignorant? YOU. The bitching in these comment sections is amazing especially when you consider Eli doesn't get paid to do this. Whether you get paid or not, you post sopmething you open yourself up to critism. That being said this is a fun site to come to and see what all is being said in the Sunflower League. Keep up the work Eli and just get a thick skin for all the backlash. It will come and there is no stoping it. I'm not sure the last time that happened, if ever. The biggest game I've seen was week four of the 2009 season when James Franklin rushed for 340 yards and four touchdowns. That broke Jim Bouknight's Olathe North school record of 330 rushing yards in a single game. I think there was a south player a few years (4-8 years) back that had 400. I only remember because it was a big deal they were running it up on some nobody. Nice article Eli! Just to put my spin on some of the comments. First, I hope the 400 yd rushing comment person comes to grips with their jealousy issues. Obviously some deep seated hatred...oh well, that is his/her problem. Second, unless someone is actually in the huddle, I can see how you might think it is a triple option. In fact, the wing T offense, which South uses, has a variety of "double" option components. Third, none of the above matters. You did a nice article on a very nice kid. Thanks for all the hard work you put into this blog. Ok, maybe it's not 400 yds a game, maybe 400 yds in 2 game BFD. Point is that averaging less than 50 yds a game by OS is nothing to get real excited about!!! Bubba Starling ran for 397 yards in the semi's last season. The only reason anyone knows this kids name is becasue his dad! Have fun living in his shadow!! Enough about Frankie, What is happening with Boomer Welsh? Played in the NFL or carried a clipboard. There is a difference. Stay off the kids dad. Dad was a good college player. But not NFL. Threw 3 picks first NFL game by telegraphing passes. Only got a shot because of NFL strike. Ended career with semi pro team the orange coast dolphins. Just wanted to clarify. How many years did your Dad play in the NFL? Carrying a clipboard? Washing Jocks? I'm going to guess none, I think you're suffering from Dad envy. Get over it.